26-year old center Livingston Munnings (C-92) had a great game in the last round for Rockets and receives a Interperformances Player of the Week award for round 9. 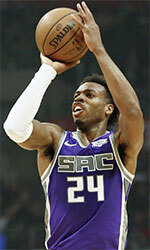 He had a double-double of 25 points and 18 rebounds, while his team beat Pirates (#7, 3-6) 100-88. Rockets maintains the 3rd position in Bahamas league. They would have been even better if they did not have these two lost games earlier in Regular Season. Rockets will need more victories to improve their 7-2 record. It's Munnings' second year at Rockets and it's hard to imagine this team without him. Munnings has impressive league stats. He is in league's top in points (4th best: 19.0ppg), rebounds (3rd best: 14.4rpg) and averages solid 3.3bpg,2.4spg and 56.5% FGP. 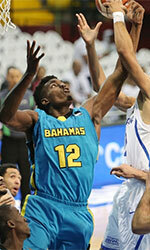 Second best performed player last round was Lerecus Armbrister (PG). He is a guard in his second season at Rockets. In the last game Armbrister recorded impressive 24 points, 5 rebounds and 4 assists. Of course Rockets cruised to a 100-88 relatively comfortable win over the lower-ranked Pirates (#7, 3-6). Rockets' 3rd position in the standings has not changed. His team's 7-2 record is not bad at all. Armbrister is well-known at Rockets and together with Livingston Munnings he already established his position as one of the team's leaders. Third place about best performers goes to guard Jackson Jacob (186-G) of league's leader Giants. Jacob scored 26 points and passed six assists. He was a key player of Giants, leading his team to a 114-78 easy win against the lower-ranked Defenders (#8, 1-7). Giants have amazing season winning all 7 games without a single defeat. Jacob turns to be one of the very best players in the league while he is also a leader of the top team having his eyes on the championship title. Jacob has a very solid season. In 7 games in Bahamas he scored 13.9ppg.